The Bajaj New Light Weight Iron is a dry iron which is handy and portable with its extra light weight body. The non-stick coated soleplate on this Bajaj iron gives you a smooth ironing experience. This soleplate prevents the fabric from sticking to the iron in case of any overheating. The ergonomic handle of this Bajaj appliance is an added advantage that aids in comfortable grip. This Bajaj New Light Weight iron comes with a flexible swivel cord for free left and right movement. It also reduces the pressure on your wrist and palm even during prolonged ironing sessions. The Bajaj New Light Weight Iron features instant heating technology that is specially implemented to save your time. 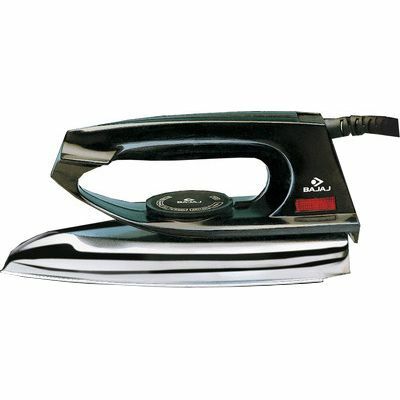 This Bajaj dry Iron has super clean surface finish for easy maintenance. The Bajaj New Light Weight Iron features adjustable thermostatic control to set variable temperatures for different kinds of fabric. Higher temperature can be set for clothes with stubborn creases and lower temperature for delicate materials. This Bajaj light weight dry iron has thermal fuse as an additional safety feature. This disconnects the current to the heating element when there is any fault in the power supply. It will otherwise result in rise of temperature and eventually create a short circuit.